Fish oil is associated with benefits for the cardiovascular system and generally not with benefits for skin. However, a small amount of research indicates it may have some limited positive effects on skin, according to the University of Maryland Medical Center. You can obtain fish oil by eating fatty fish or by taking supplements. The omega-3 fatty acid content of fish oil seems to account for most of its benefits, according to the U.S. National Institutes of Health at its MedlinePlus website. Because the body does not produce these essential fatty acids, people must consume them through diet or supplements. Many kinds of fish are excellent sources, especially anchovies, halibut, herring, mackerel, salmon, sardines, sturgeon, trout and tuna. A study published in the April 1998 issue of the "Journal of the American Academy of Dermatology" found that providing omega-3 fatty acids intravenously over 14 days was effective for treating patients hospitalized for chronic and severe plaque-type psoriasis. The solution contained 4.2 g of docosahexaenoic acid, or DHA, and eicosapentaenoic acid, or EPA, both of which occur in fish oil. The UMMC notes that a larger study of psoriasis patients did not find any benefits connected with taking oral fish oil supplements. Eating fish and taking fish oil supplements are often recommended for cardiovascular health, as noted by MedlinePlus. Fish oil helps reduce blood pressure and triglyceride levels, and may help prevent heart disease and stroke. 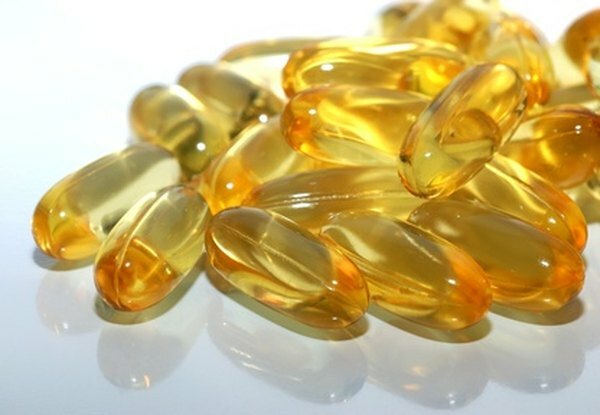 Fish oil may be useful for relieving symptoms of dry eye syndrome, improving asthma in children, relieving symptoms of rheumatoid arthritis and reducing cholesterol levels in combination with statin medications. Dietary fish oil decreases sensitivity to ultraviolet light, perhaps due to its antioxidant effects, according to a study published in the August 1994 issue of the "Journal of Investigative Dermatology." In this experiment, 15 participants took 10 g fish oil, standardized for DHA and EPA content, per day for up to six months and experienced a "pronounced" reduction in sensitivity to ultraviolet light. The UMMC cautions that topical sunscreens are much more effective at protecting skin from sun damage. Fish oil may be effective for certain skin problems because omega-3 fatty acids are anti-inflammatory and decrease pain and swelling. In addition, EPA and DHA may suppress an overactive immune response involved in psoriasis.